UPDATED: Thu., Aug. 23, 2018, 9:52 p.m.
BOISE – Nearly a year after the death of former U.S. Interior Secretary and Democratic Gov. Cecil Andrus, his eldest daughter stood outside the Idaho Capitol on Thursday determined to uphold one of her father’s most lasting legacies. At issue is the U.S. Department of Energy’s announcement that it’s considering extending the use of an eastern Idaho nuclear waste treatment facility beyond its scheduled closure. The reason? The federal government wants to explore the possibility of allowing the facility to repackage radioactive waste brought in from other states before sending it to a permanent site in New Mexico. However, since the announcement was made earlier this year, Idaho energy activists have been on high alert. To many opponents, the idea is a way for the federal government to circumvent a 1995 agreement that outlines strict limits on how much nuclear waste can come into the state. Billboards have gone up urging Idahoans to call Attorney General Lawrence Wasden and oppose amending the agreement. Others have passed around a petition demanding the federal government clean up the nuclear waste already in Idaho before sending new shipments to the state. Wasden said he’s encouraged by recent discussions with Department of Energy officials regarding cleanup of the Idaho waste and future operations, adding that the processing and shipment of the existing Idaho waste remains one of his priorities. “Dad squared off with the Department of Energy over issues of nuclear waste for nearly 50 years and during that time DOE lied to him over and over and over,” Tracy Andrus said. It wasn’t until the agreement was reached, she said, that Idaho had a legal document providing protection from the federal government bringing unlimited amounts of waste into the Gem State. The agreement also said waste brought in from out of state must be treated within six months of arriving and that it be shipped out within the following six months. Those in attendance at the rally held signs that read “Don’t waste Idaho” and quietly cheered. 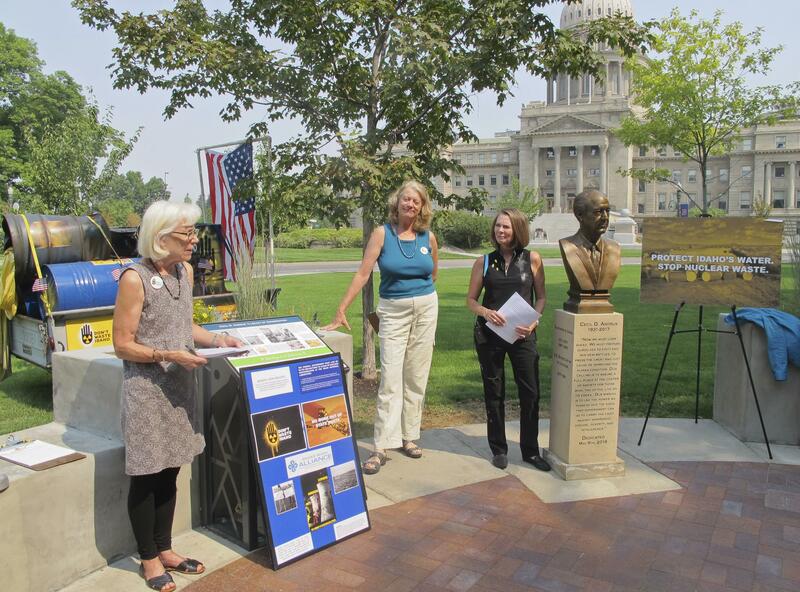 Tracy Andrus stood next to a bust of her father’s image in a park named after Idaho’s last Democratic governor. Cecil Andrus, who died on Aug. 24, 2017 – just a day shy of his 85th birthday – launched one of his biggest fights during the waning days as governor when he blocked the U.S. Department of Energy in 1988 from shipping radioactive waste from a Colorado nuclear weapons site to the Idaho National Laboratory. After accepting the waste on a temporary basis for 17 years, Andrus said, Idaho would no longer be the nation’s radioactive garbage dump. The standoff persisted through his Republican successor, Gov. Phil Batt, and the energy department ultimately signed a 1995 agreement to remove all the radioactive rubbish that had been dumped in Idaho since the Cold War. When the federal government challenged the terms of that agreement in court in 2006, Andrus took the witness stand to help the state’s successful case to hold federal energy officials to the cleanup commitment. Andrus resigned midway through his second term as Idaho governor in 1977 to become President Jimmy Carter’s Interior Department secretary and served until Carter’s term ended four years later. He was then elected governor two more times, becoming the first four-term governor in Idaho history. Published: Aug. 23, 2018, 6:46 p.m. Updated: Aug. 23, 2018, 9:52 p.m.